Home ACT ACT vs. SAT: Which Should You Take For College? ACT vs. SAT: Which Should You Take For College? Most university and colleges will require you to take a standardized entrance exam to test whether you will be accepted into the major or program of your choice. Schools normally accept both the ACT and SAT for admissions scores.. It sometimes gets a bit confusing for you to choose between these two options since so many things are similar, but different. In order to make the correct choice, you have to take a lot of considerations into account. Below we give an ACT vs. 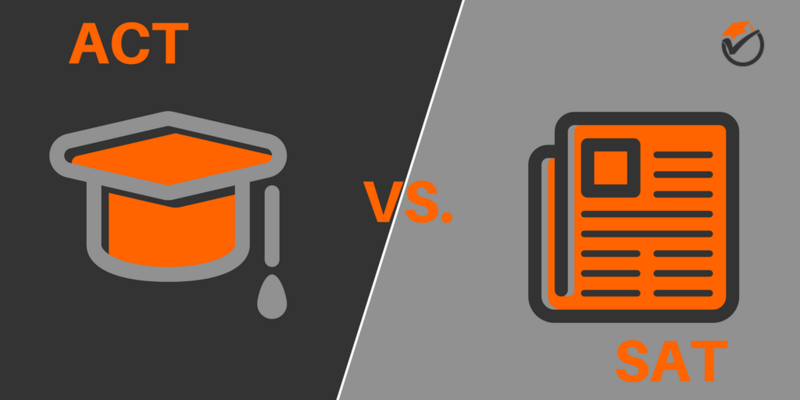 SAT comparison table and go over the differences and considerations you need to take into account while deciding between the two. English, Math, Reading, and Science scores will each range between 1-36. Composite ACT score is the average of your scores on the four sections; ranges between 1-36 Scoring Math and Evidence-Based Reading & Writing are each scored on a scale of 200-800. Composite SAT score is the sum of the two section scores and ranged from 400-1600. There is no penalty for guessing. Wrong Answer Penalty There is no penalty for guessing. There are many contrasts amongst the ACT and SAT exams. We will label these in the segments below. One difference between the two exams is that the ACT has a science section while the SAT does not. This science section tests different things like data and chart analysis, which are covered much less on the SAT or not covered at all. Another dissimilarity between the test layouts is that the time allotted per question on the ACT is a lot lower than on the SAT. This means that on the ACT you will have less time to complete each question than on the SAT. This can lead to test takers feeling rushed or hurried, possibly lowering their score. This is made up by the fact that the questions on the ACT are usually more straight forward and less complex, but not necessarily less difficult. Yet another difference between the 2 test arrangements is that the ACT is scored on a scale of 1 to 36 while the SAT is scored on a scale of 400 to 1600. Since the ACT only scores in whole numbers, there are a lot of times where your score can be rounded as compared to the SAT. Although this is minor, you could theoretically raise your score by a half a point on the ACT if you fall on the line. The 2 exams also differ between their popularity, availability and cost. The SAT is slightly more expensive than the ACT, but not by much. It is $45 for the SAT and $42.50 for the ACT. This really should not have an effect on which exam you choose to take. In terms of its popularity, the ACT is slightly more popular than the SAT. Since the 2 tests have the same objective, testing students’ competence going into university, they have the same number of test takers. Most, if not all, colleges and universities accept both the ACT and the SAT. The SAT is also offered 7 times a year instead of 6 for the ACT. The 2 tests also differ from each other in regards to how they structure the writing portion of the exam. The passage reading level on the ACT usually stays at a constant medium difficulty, while the passages in the SAT are sometimes easier, and sometimes harder. This means that the SAT writing portion has a chance to be really easy, or really difficult. Since the SAT is graded on a curve, this easier or harder difficulty should not have an effect on your score. Another difference between the 2 writing portions of the exam is that the writing questions on the ACT mostly come from the content inside the packages, while the SAT can also ask questions on side graphs and tables. The ACT uses the science section to test students’ knowledge on interpreting graphs and charts, while the SAT puts those types of questions into the writing section. The 2 exams are also very different in their math sections. The biggest difference is the fact that the SAT has a “no calculator” portion and a calculator-allowed portion of their math section, while the ACT allows a calculator in the entirety of their math section. This is made up by the fact that the ACT is more stringent on their calculator requirements, making sure to ban calculators with particularly advanced features. The content of the math section of the ACT is also considered a little bit more difficult than the math section of the SAT. This is because the ACT focuses a lot more on the advanced algebra and trigonometry on its exam, while the SAT only makes these subjects a smaller portion. Even though the content of the ACT is considered harder, the way the questions are asked in the SAT are considered tougher. In the ACT, all of the questions are multiple choice, meaning that you will always have a chance to randomly guess and get the question correct. In addition to multiple choice, the SAT also has questions that are fill in the blank, making guessing much more difficult. The differences between the 2 tests on the reading section are similar to the differences that you will encounter on the writing section of the exams. The number of passages between the two exams is somewhat similar. There are 4 passages on the ACT while there are 5 passages on the SAT. Just like the writing portion of the exam, the passages on the ACT are around the same reading level: medium. The passages on the SAT exam can differ in difficulty between very easy and very difficult. Since everyone answers the same questions and reads the same passages, this should not change your score in the long run. ACT vs. SAT: Which Is Right For You? What majors or programs are you looking at? Depending on your major or program that you are looking at, some may prefer either the ACT or the SAT. You should check with an admissions officer to make sure that you know what their preference is. The normal train of thought is that the ACT is geared more towards science and STEM majors, while the SAT is geared more towards liberal arts majors. This mostly stems from the fact that the ACT has a science section while the SAT does not. What schools are you looking applying to? Most schools, regardless of major, mostly accept both the ACT and the SAT for admission. Some schools, however, prefer one or the other. Make sure to consult the admissions office of the schools of your choice to make sure that you are taking their preferred test. Are you a fast test taker? This is the area where most test takers will decide which test is the best for them, if their preferred school or program does not have a preferred test. The ACT is known for being more fast-paced than the SAT. If you take your time on tests, then the SAT may be the better choice. If you are a speed demon and are usually one of the first students to finish an exam in your class in high school, then the ACT may be for you. Are you good at interpreting data and trends? With the science section on the ACT, the ACT requires more knowledge on how to interpret data, charts and trends. The SAT has some of these types of questions, but certainly not as many as the ACT and not with scientific data. If you are not good with charts and graphs, the SAT may be more up your alley, but if you are, the ACT could be the better choice. Are you good at mental math? Both tests test you heavily in math, but only the SAT has a portion of the math section where calculators are not allowed. On this part of the exam you are required to do quick calculations in your head. The ACT math section allows a calculator on every question, so you can use it as a crutch if you are weak at mental math. If you are especially good at mental math, the SAT may be more your style. ACT vs. SAT: Should you take both? You should focus one just one test. Putting all of your effort on just one test will allow you to get good at the types of questions asked for that certain test. Every minute spent preparing for another test in effect lowers the score for the other. Not to mention all of the extra test prep material that you will need to buy for both tests. Sometimes if a school is very competitive, like an Ivy league school or MIT, it is a good idea to take both tests. If you are confident that you can do very well on both, taking both tests and scoring well can show a more rounded student. This can put you above others when the admissions office is deciding who to cut for the next round. Sometimes in the process of getting your highest score on an exam, you feel that you would be better suited taking the other. Sometimes our decisions and aspects affecting those decisions can change, so don’t be afraid to change with them. Are you looking for a list of the best prep books for either the ACT or the SAT?